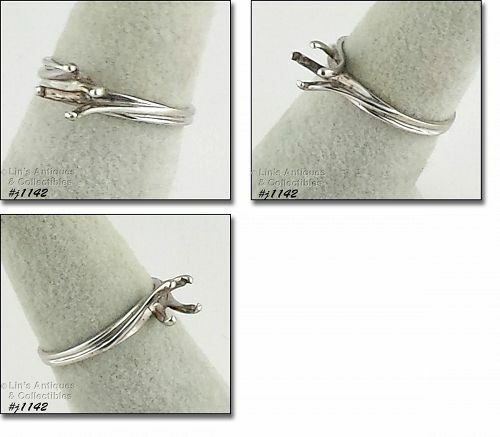 This listing has a 10k white gold ring – mounting only! Ring is size 6 1/2 and is marked 10k and FC. It is a 4 prong setting with prongs measuring 1/4" from prong to prong. Ring has beautiful style mount, please see photo. I purchased this ring years ago intending to set with an amethyst but I put the amethyst into a gold mount instead. I’ve grouped these vintage butterfly shaped pins into one listing! 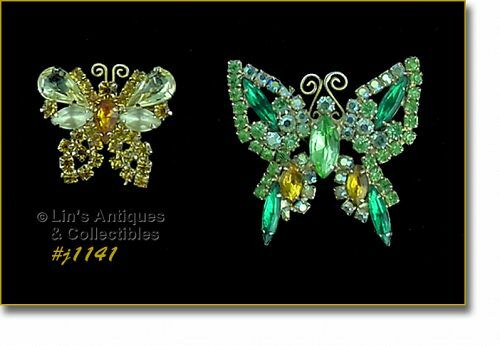 There are two butterfly pins – different sizes and colors – each covered in rhinestones. The largest one is gold-tone and measures 1 3/4" x 1 3/4" with shades of green rhinestones and two topaz color rhinestones. All are prong-set. The other one is also gold-tone and measures 1 1/4" x 1 1/4” with topaz and clear rhinestones. All rhinestones are prong-set. 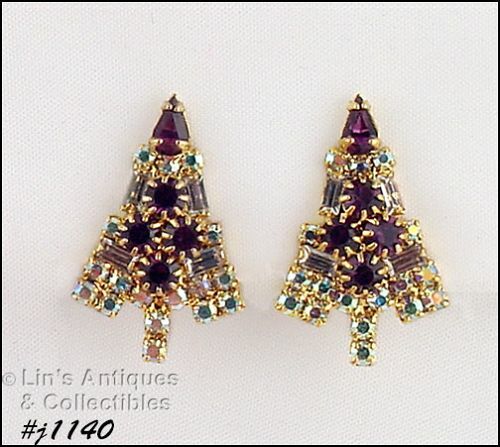 This Eisenberg Ice listing has clip back candle tree shaped Christmas earrings! They are gold-tone with purple and aurora borealis round rhinestones – super sparkly! The “candles” are baguette shape clear rhinestones and the tree “topper” is a purple pear shape rhinestone. Earrings measure 1” x 5/8” at longest and widest. They are marked Eisenberg Ice and are new old stock; never worn. I have 2 pairs available in this listing. This listing has a vintage 10k white gold diamond wedding or anniversary band! Ring has 9 small diamonds and I would estimate total carat weight to be .9 -- .10 – could be more; this is just a guesstimate by me. The ring is size 7 and measures 1/8” wide. Any dark spots on the band are simply lighting/camera flash. 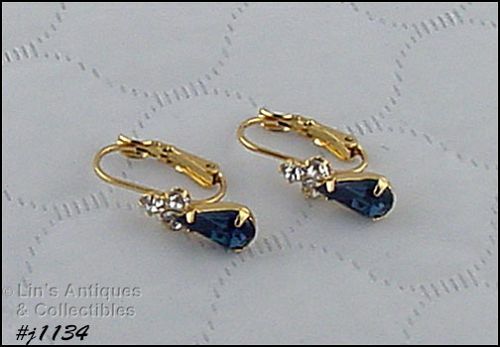 This listing has beautiful Eisenberg Ice rhinestone pierced earrings! They are gold-tone with lever back closure. 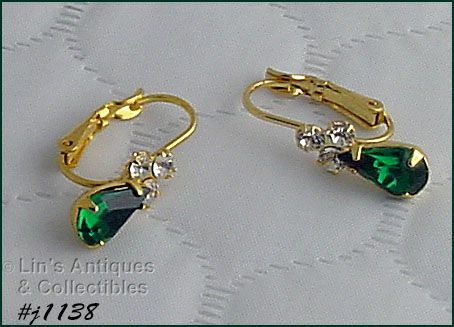 Earrings have 3 clear round rhinestones above a single pear shaped emerald green color rhinestone. All rhinestones are prong-set. These lovely earrings would be perfect for Christmas or something green for St. Patrick's Day! They measure 5/8" x 1/4" at rhinestone part. 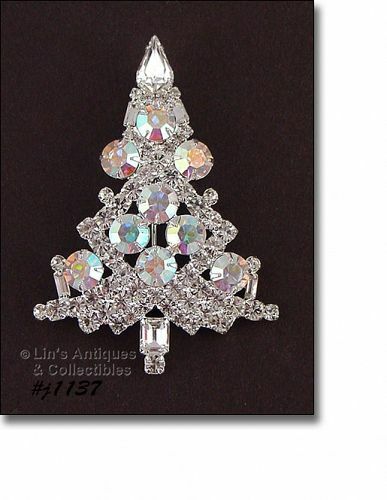 This listing has an absolutely beautiful Eisenberg Ice Christmas tree shaped pin! This is the larger size candle tree brooch – 3” long (at longest) and 2 1/16” wide (at widest). All rhinestones are prong-set and are clear with large round aurora borealis rhinestones set as “decorations”. Pin is marked Eisenberg Ice and is new old stock; never worn. This Christmas brooch is a definite eye-catcher with so much sparkle and attention to detail. 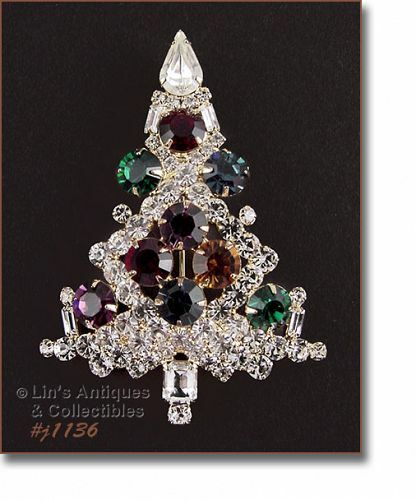 This listing has a beautiful larger size Eisenberg Ice Christmas tree pin! Brooch is the larger candle tree style. It measures 3” long (at longest) and 2 1/16” wide (at widest). Pin is gold tone and is covered with clear rhinestones with nine larger rhinestones in assorted colors placed as “ornaments” on the tree. All rhinestones are prong set and super sparkly. It is marked Eisenberg Ice and is new old stock; never worn. This Eisenberg Ice listing has gorgeous sparkly clear rhinestones pierced earrings! They’re gold-tone with lever back closure. The rhinestones are halo style – a larger clear round center rhinestone that is surrounded with smaller clear rhinestones. The rhinestone portion measures 1/4" diameter. Earrings are unmarked (no room) but are still on the original Eisenberg Ice store hang/display card. They are new old stock; never worn. 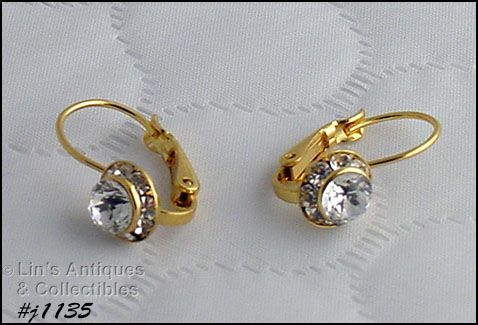 Very pretty Eisenberg Ice rhinestone pierced earrings in this listing! They’re gold-tone with three round clear rhinestones and one pear shape blue color rhinestone. Earrings are lever back style and measure 5/8” x 1/4" (at longest and widest of rhinestones portion). Because of their size and shape, they are unmarked but are still on the original store hang/display card. They are Eisenberg Ice new old stock; never worn. This listing has a colorful and fun Eisenberg pin! 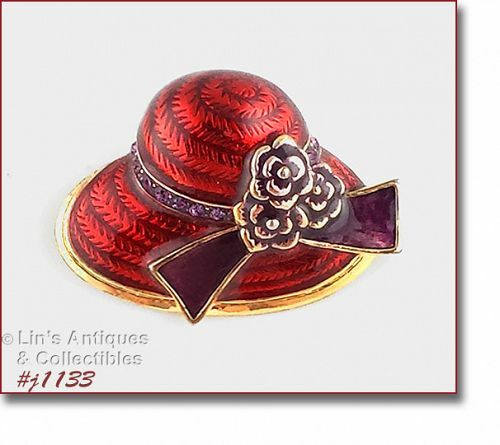 It’s gold-tone hat shaped with red enameling. The hat has a purple rhinestone and purple enamel ribbon around the hat brim along with three flower accents. Brooch measures 1 ¾” x 1 ¼” (longest and widest) and is marked Eisenberg Ice. As with the majority of my Eisenberg Ice listings, this pin is new old stock; never worn. 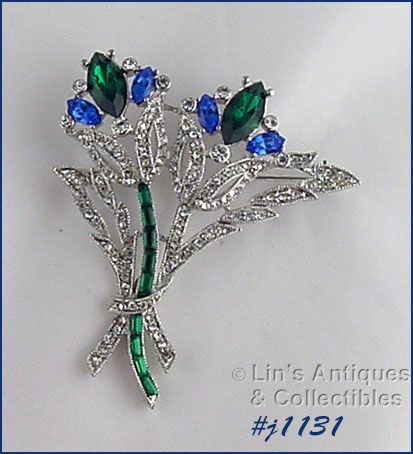 This is one of my favorite Eisenberg Ice pins – it’s a rhinestone floral bouquet! There are two flowers that remind me of thistle. The leaves are covered with round, clear rhinestones. One flower has a stem of green baguette rhinestones and the other floral stem has round shaped clear rhinestones. Brooch measures 2 3/4" x 2 1/4” (longest and widest) and is marked Eisenberg Ice. Pin is new old stock; never worn. 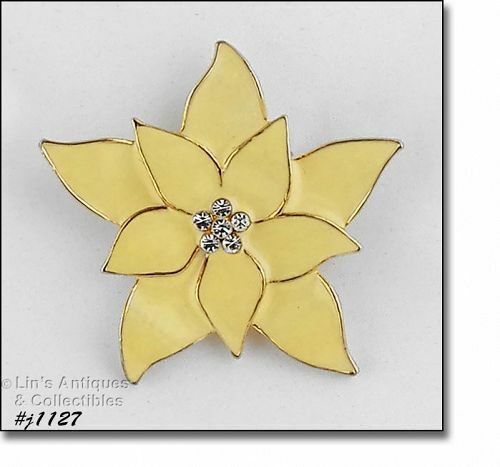 This listing has an Eisenberg Ice pinwheel shaped pin! Brooch is silver-tone with blue marquis shaped rhinestones, round clear rhinestones, and a single large round dark blue color rhinestone in the center. All rhinestones are prong-set, pin measures 1 1/2” diameter, and is marked Eisenberg Ice. It is new old stock; never worn. 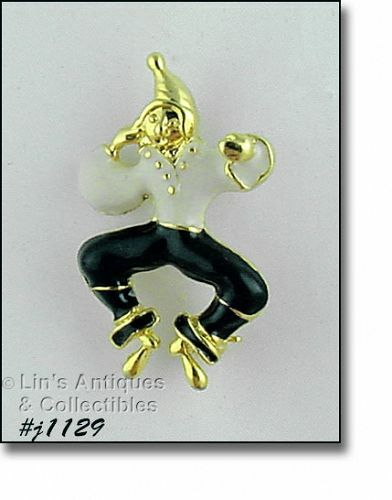 This listing has a whimsical vintage Eisenberg Ice pin – a court jester! Brooch is gold-tone and jester “wears” a white shirt and black pants. It measures 1 3/4" 1 1/8” (at longest and widest), and is marked Eisenberg Ice. 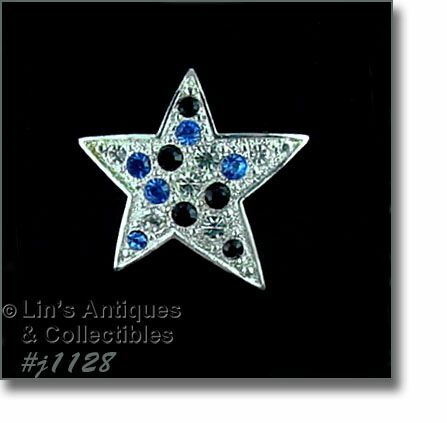 This listing has a vintage Eisenberg Ice patriotic star shaped pin! Brooch is silver-tone with red, blue, and clear rhinestones! It measures 1 1/2" x 1 1/2" (longest and widest) and is marked Eisenberg Ice. I have 2 available in this listing. 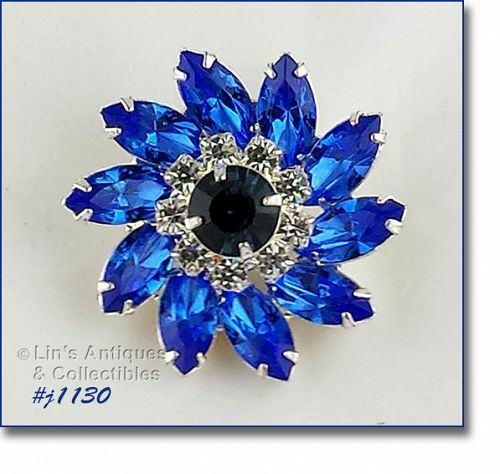 This is another unusual color vintage Eisenberg Ice poinsettia pin! Brooch is what I would best describe as pudding yellow (or as our niece says “puddin’ yellow”) with clear rhinestones in the center. It measures 2” x 2” and is marked Eisenberg Ice. This pin, as with the majority of my Eisenberg Ice items, is new old stock and has never been worn. Thank you for visiting our online shop at Cyberattic! These Eisenberg Ice earrings are simply fun earrings! 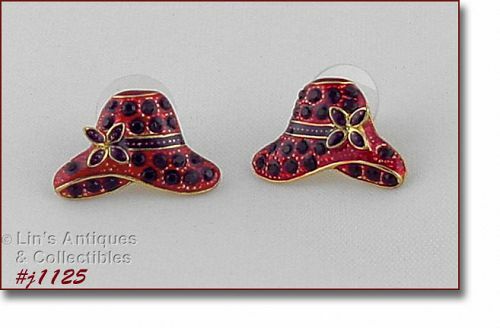 They’re hat shaped with red enameling and purple rhinestones – there’s even a purple flower accent. Earrings are gold-tone, measure 1/2” x 3/4", and are marked Eisenberg Ice. 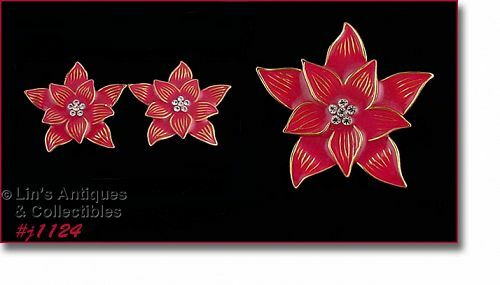 These vintage Eisenberg Ice poinsettias are a different color than usually found – they are best described as coral! The brooch measures 2” x 2” and is marked Eisenberg Ice. The earrings are pierced style, measure 1 3/16” long (at longest), 1 1/16” wide (at widest), and are marked Eisenberg Ice. As with the majority of my Eisenberg Ice items, this set is new old stock and has never been worn. 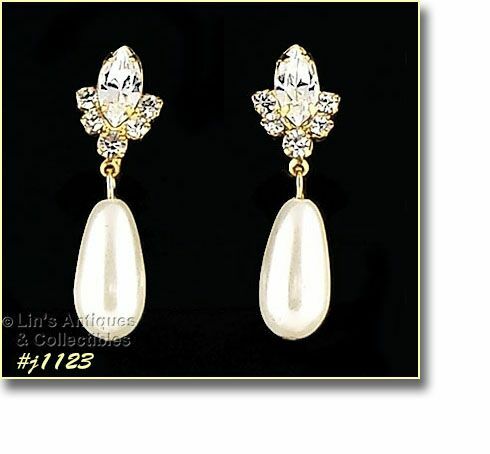 This listing has a beautiful pair of Eisenberg Ice clear prong-set rhinestone with faux pearl dangle clip back earrings! The earrings measure 1 3/8” in length including the pearl dangle at 3/4". Earrings are not marked but are still on the original store hang/display card, new old stock, never worn. There is no discoloration/yellowing of the rhinestones – it’s just lighting for the camera.